Filament Friday focuses on making the most innovative and highest quality 3D printing products. Our focus is on the avid 3D printer, which means our 3D print tool kit tools must be designed to perform. 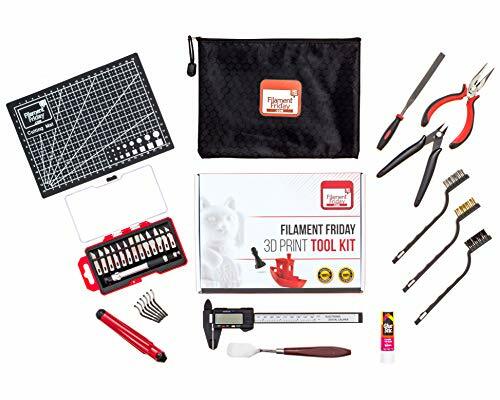 Filament Friday confidently creates the most valueable kit where each tool has been hand picked, aimed to construct an exceptional 3D printing process. Removal Tool: Make removing your print from your 3D printer simple by sliding the thin blade underneath your 3D printed object. Electronic Digital Caliper: Create the perfect print by using the caliper to measure both inner/outer dimensions of an object or filament. *Extra batteries not included. Needle Nose Pliers: Use the needle nose pliers to help remove excess filament from the hot extruder nozzle, or to reach hard to access places within the 3D printer. Deburring Tool: Use the deburring tool on/within your 3D print. This tool rotates 360° creating a deep clean. Cutting Mat: Apply your cutting mat before using the knife to avoid damage to your work space. Avery Glue Stick: Use your Avery Glue Stick for coating the heating bed of your 3D printer. Filing Tool: Use your filing tool to manage the rough edges of your 3D print by rubbing the tool against stubborn pieces of material. Knife Clean Up Kit: Remove any excess debris by using the knife clean up kit. This set offers a variety of 13 blades and also includes a safe-lock storage to keep blades organized. Diagonal Wire Cutters: Use your diagonal wire cutters to cut filament and other thin material associated with 3D printing. Wire Brushes: Use your wire brushes to sweep away excess filament from the extruder nozzle or print bed. Zipper Pouch: Use your Filament Friday pouch to hold your tools. ON SALE FOR LIMITED TIME ONLY: Sale price is available to first 50 customers only during release period. This kit has everything to make 3D printing easy and the printed results spectacular. Meet the all-new Lorei 3D printer. With its unique design this 3D printer was developed to combine everything you are looking for in a printer. The Lorei boasts a full 9x9x12in build volume and hotend capabilities reaching 300 degrees C that allow you to widen your material choices. A built in LCD is also included with full online support that gets you printing right out of the box. Whether you are new to 3D printing or are looking to expand your tech arsenal, be bold and start making outside the box with the Lorei 3D printer.